In the game of the Ukrainian league Matchday 10, October 3, the Pitmen entertained Chornomorets. Mircea Lucescu carried out considerable squad rotation compared to the PSG clash in the Champions League – only four players, who were involved in the game versus the Paris side, were fielded in the starting line-up for the Chornomorets game: Darijo Srna, Oleksandr Kucher, Fred and Alex Teixeira. Mykola Matvienko was deployed as a centre back, for the young player it was the league debut for the senior team. And Anton Kanibolotskyy had not taken to the pitch since 9 August. Shakhtar started energetically, and as early as on 7 minutes, Srna made a pass into the penalty area to Viktor Kovalenko, who was brought down by the goalkeeper. Teixeira confidently converted a penalty kick to score his 13th goal in 10 matches. Soon Alex had a decent chance from open play but his shot from close range was blocked by the defender. In one of the attacks Kovalenko and Taras Stepanenko could have scored after taking headed shots, - the visitors cleared the ball off the goal line on both occasions. On 24 minutes, Kovalenko had another chance to score, but his shot towards far corner was blocked by the goalkeeper. Chornomorets first defended with the whole team, but gradually were taking the game to the opponents’ half. Shakhtar continued creating chances, and Teixeira could have scored on 36 minutes – a shot from the Brazilian from 11 metres was parried away by the goalkeeper. Plus there were a couple of episodes when the ball was inside the visitors’ penalty area. The Pitmen took a lot of shots from close range but their shots were blocked by the opponents. The first half finished with Shakhtar enjoying a narrow 1-0 lead. In the beginning of the second half, Teixeira sealed his brace. After intercepting the ball inside the opposition penalty area and a Bernard cross to the far post Alex seized on the rebound to make it 2-0. It was Teixeira’s 14th goal in the season. Chornomorets tried to pay more energetically in the attacking third, and Kanibolotskyy had to do some work sometimes. On 65 minutes, Teixeira made a run down the left flank to skip past two defenders and cross dangerously – the opponents failed to slot the ball in. Bernard was unlucky as he took four shots from very comfortable positions: the ball would fly wide, be blocked by the opposition defenders, or Chornomorets goalkeeper would make saves. Three more chances were created by players, who came on as subs. 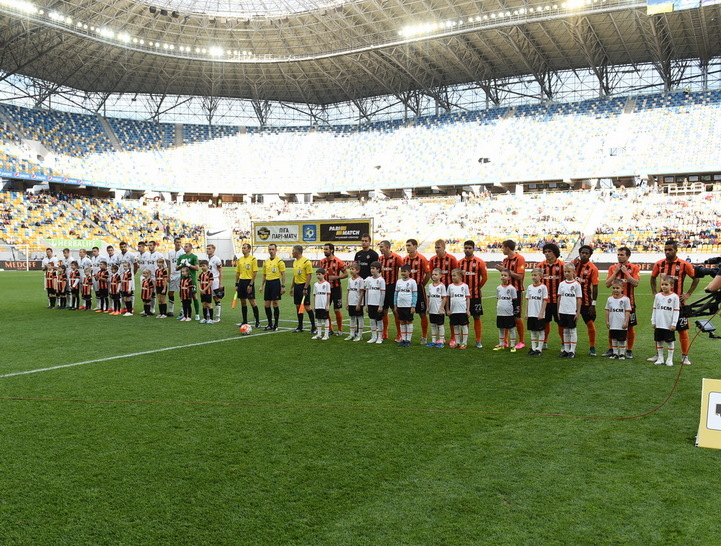 Taison fired the ball wide of the goal post, Marlos made a perfect pass to Maksym Malyshev, who sent the ball over the crossbar, and Taison missed the target from close range. Darijo Srna was named the best player of the match. Having beaten Chornomorets 2-0, the Pitmen have 25 points and will play away at Dynamo on 16 October.